The aroma of coffee is a much advertised one. A lovely hot cup of coffee wakes one up, energizes; one faces the day all set to make a success of it. Café Coffee Day outlets in India are tastefully decorated and offer an idyllic setting to catch up with friends or a loved one. I guess it would be the same in any other country too, with variations in the names and themes of the chain. But I am not marketing coffee; just sharing a memory. I was lucky in that I grew up in a small village in Kerala. I was also lucky in that in my childhood, in the season when the few coffee bushes we cultivated were in bloom, I would wake up to the sweet scent of coffee blossoms. It would permeate my dreams- the gentle, happy and innocent childhood ones – and would slowly wake me up with its sheer sweetness. And I would run out to witness this yearly wonder. 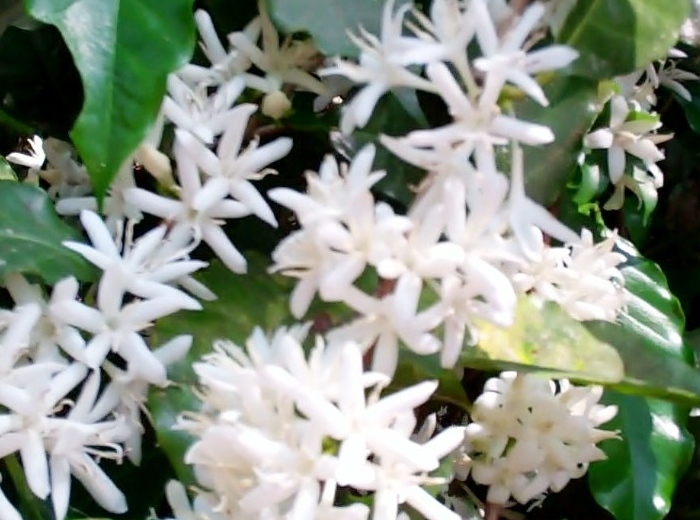 Coffee blossoms are small and white; they bloom in the early mornings and are really not much to look at. They form in clusters on the branches of the plant. But how does one describe their perfume? Sweeter than roses or jasmines- poignant, reminiscent of long gone times. For obvious reasons, no one picked the blooms, which later transformed into clusters of green berries and later ripened into cherry red ones. They would then be picked, dried and sold. The coffee bushes are no more- I am no longer the eager child who jumped out of bed and ran to them. But somewhere in a corner of my heart, the now-non-existent village, bushes and the child remain! The weather of Kerala is highly suitable for growing spices. There was a rich trade as early as 3000 B.C in spices, which were famed in the Western world. My parents grew coconut, pepper, coffee, cinnamon, nutmeg and cocoa in our land. Our lives, my entire education, were paid for by these exotic spices, which found their way to foreign lands from the Cochin port. The Cinnamon tree, which brought forth the most wonderful pink young leaves in spring, sacrificed the most. The spice cinnamon is not the berry, but the bark. The tree would be shorn annually and the twigs would be dried in the sun and then the bark removed carefully. Today the demands of urbanization have transformed my village beyond recognition. Like many Indian villages, mine too continues to live only in cherished memories. Important as progress and development is, despite the strides made in the quality of living, sometimes the nostalgia for things gone by, falls over me like an old, worn and soft blanket.